Check the Palace of Versailles' calendar for Musical Garden exact dates and times. Order tickets to the Palace and grounds ahead of time online. The Musical Gardens only occur between April and the end of October. The estate is closed on Mondays so plan accordingly. Summer is always very busy and crowded—be prepared if you're visiting during that time. Late spring is far less crowded and very beautiful with all the spring flowers. Children under 18 years old are free. Château de Versailles is a must see for anyone who visits Paris. Only a short train ride away, the estate makes for a perfect day trip out of the city. While the main palace itself can be a bit overwhelming with little ones, the rest of the grounds and "mini" palaces are great for families to explore. Parents will love the history and splendor while kids will enjoy running around beautiful gardens. 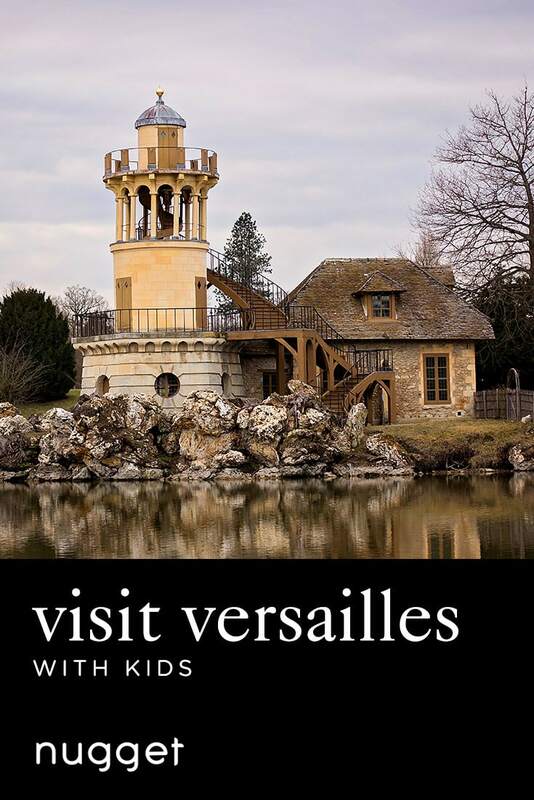 Enjoy a day fit for royalty at Versailles. The gardens of Versailles are gorgeous on their own and even more enjoyable with fountains "dancing" to classical music. Your nugget will love running alongside you and watching the fountains while you take in the breathtaking beauty of the gardens. Don't forget to get some photos of your nugget enjoying the royal gardens! DIRECTIONS Take the RER Line C train from Paris to Versailles. Walk behind the palace and straight into the main gardens. Make sure to pick up a map of the grounds on your way in. TIP The nearest bathrooms cost one euro. You can find free ones if you backtrack to the palace or wait until the Grand/Petit Trianon. The Petit Trianon was Marie Antoinette's private estate and is a smaller and much more manageable palace to tour. It still has all the splendor, but is far less crowded than the main palace and takes less time to walk through. Our girls loved finding all the different clocks in each room and seeing where the Queen lived while we enjoyed the history. DIRECTIONS Continue walking through the gardens, following the signs for the Petit Trianon. Stop at the stand near the Apollo fountain for a baguette sandwich and/or an ice cream to eat on the way. TIP The palace itself is not stroller accessible but does have stroller parking. The Queen's hamlet is such a charming place full of little buildings with thatched roofs, a pond full of swans, and beautiful wildflowers everywhere. The best part though is the working farm, complete with sheep, rabbits, and more. This was our nuggets' favorite part of the estate. They loved running around the village and seeing all of the animals, and we loved taking in more of the history. This is also a great place to take some vacation photos! DIRECTIONS Pick up your stroller from stroller parking and head out the back doors of the Petit Trianon into the gardens. If your little one needs an afternoon nap, this is a great time to do so. Walk through the gardens all the way to the back until you reach the hamlet of Queen Marie Antoinette.